Just about everyone recognizes a Home Run product as a big hit. That’s a phrase that just easily transcends the bounds of the sport of baseball into everyday life. The terms Home Run and Grand Slam just resonate. They simply mean what they say. The vast majority of Americans know exactly what you referring to if you say that a product is a Home Run, or even better, a Grand Slam. However, what do you call something that isn’t a Home Run? A Base Hit or Single doesn’t need too much explaining, either. That is a hit that earns you one base in the sport of baseball. It is the equivalent of a simple, everyday positive accomplishment. Well, the new iPad may not be a Home Run, but it’s definitely more than a Base Hit. That’s why the Stand-Up Double came to mind when I was thinking about my impressions of the deivce after a week of kicking the tires. 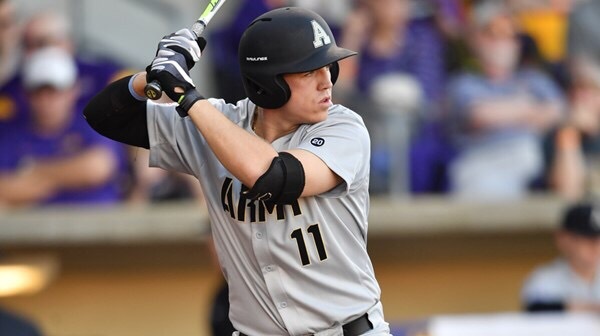 A Double is a hit that is deep enough to get you two bases, and a Stand-Up Double means that the ball was deep enough and you were fast enough to not be forced to slide to beat a throw to the base. A Stand-Up Double is an above average accomplishment that earns you a tip of the cap from your peers and fans. It’s a solid play that may not make a highlight reel, but will help your team get a win. It’s the mid-sized sedan of baseball plays, and there is absolutely nothing wrong with that. I just moved on from a 2010 Chevy Impala as a work vehicle, so I know of what I speak. It wasn’t spectacular. It wasn’t blazing fast. It was plain, old white with gray interior. It was the quintessential fleet car. However, it made it over 175,000 miles in service to our company in 7 years, and got great mileage and hardly ever had any service issues beyond the necessities of tires, oil changes, and brakes. I also had an 07 Impala before the last one, and it made it over 230,000 miles before we put it out to pasture. There is something to be said for solid dependability. This is EXACTLY how I think of the new iPad. Solid. Dependable. Reasonably priced. Unspectacular. It gets the job done and then fades into the background. For anyone who likes to buy the latest Apple gear, this device probably isn’t for you. If you currently own an Air 2 or a Pro, it DEFINITELY isn’t designed with you in mind. Like a Stand-Up Double, the new iPad isn’t making the highlight reel alongside the Home Runs and Grand Slams of the tech world. However, don’t get me wrong here. None of this is meant to be negative. This device doesn’t need to impress us Apple nerds who are compelled to own the latest and greatest at all times. After using it for a week, I feel like it will hit the mark just fine for those who it IS aimed at. I’ve said in a few articles leading up to this one that I think Apple is using this new iPad to draw a clearer line between its pro and consumer tablets going forward. The Air 2 was an iterative, but brilliant culmination of everything the iPad had been up until that point. It’s combination of screen, processor, weight, size and TouchID made it the best tablet of its generation, bar none. 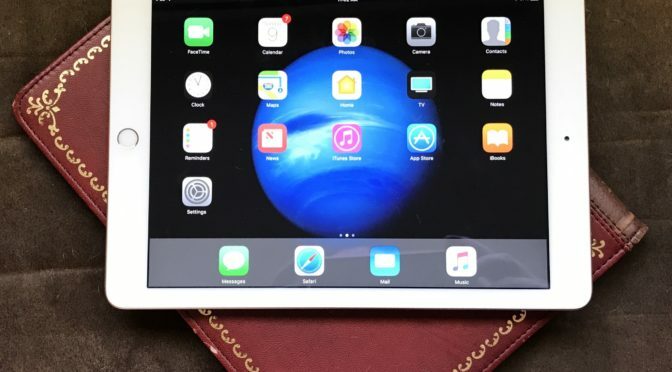 And when the original iPad Pro was released, it was set apart as much through its larger size as the new Pencil and Smart Keyboard compatibility. However, when the 9.7″ Pro came along, that line was blurred significantly. The two devices were virtually identical in size, and also weren’t too terribly far apart when it came to specs. Other than the True Tone screen technology and the Pencil and Smart Keyboard compatibility, the only other differences were mere spec bumps. And price. While those of us who use the Pencil and/or the Smart Keyboard may see the justification for the Pro’s higher price, I understand why others may not understand it, and be confused as to which is the best to fit their needs. With its combination of modest steps forward and interesting steps backward, the new iPad is much more clearly set apart from the iPad Pro line. The size and screen, while perfectly fine, are now a clear step down from the Pro line. However, by bumping the processor up to the A9, the RAM to 2GB, and the screen to a higher brightness level, this tablet is still going to feel like either a substantial upgrade or a great start for many users. Also, the new price of $329 makes the trade offs between this iPad and the Air 2 even more acceptable. In my opinion, Apple struck a really nice balance between adding the features this device needed, and removing what was a little less important in the effort to cut the price to a more budget-friendly level. So who is the new iPad for? Definitely not me. It’s a clear step down from either iPad Pro, so any owner of either device who is happy with it probably won’t be all that impressed. iPad Air 2 users may go either way, depending on how attached they are to its better screen and slimmer size. Those who appreciate the cheaper price tag and processor and memory upgrades may end up moving to the iPad at some point. It will just depend on the priorities of each individual Air 2 user and when they decide to upgrade. I’m guessing that most will stand pat or move toward the Pro at some point. This new iPad is very clearly aimed at two groups of people: new buyers who have never owned an iPad, and existing owners of the original iPad and the iPads 2, 3, 4, and Air. For new buyers, the value proposition of the lower $329 price tag should be a big draw. 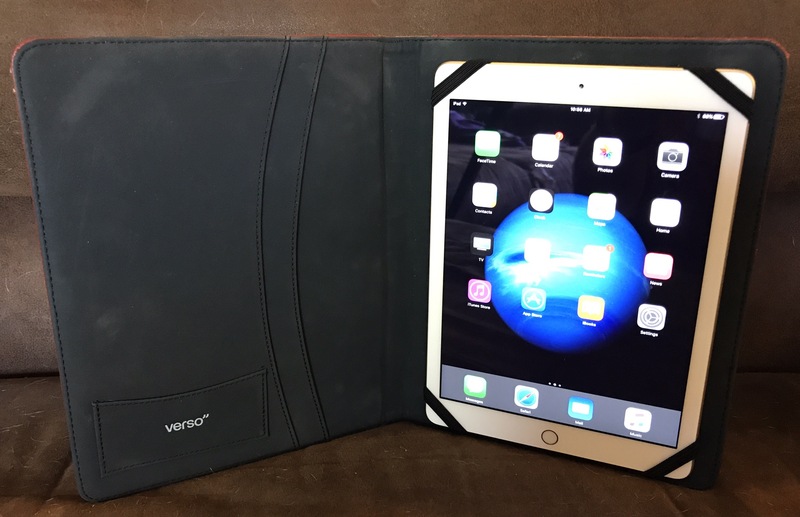 For existing users of older iPads, this new model represents a solid upgrade. 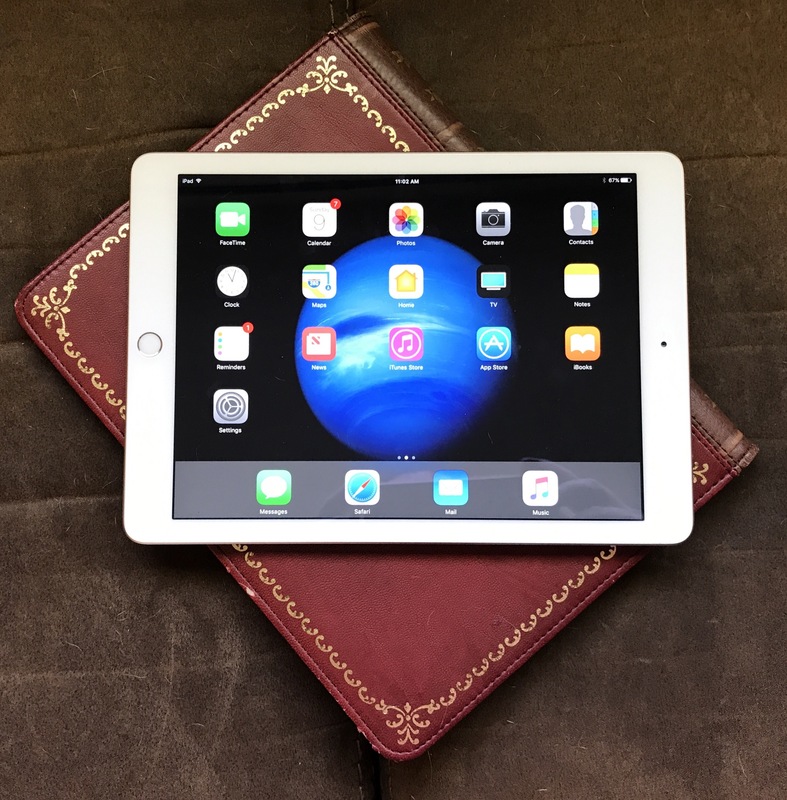 For those of us who use Air 2s or Pros, it can be hard to put ourselves in the shoes of other users, but it’s good to remember that, for someone who has been holding onto an iPad 2 for several years, the new iPad is a big step up at a more affordable price. While the iPad is bigger and heavier than the iPad Air 2 or the 9.7″ iPad Pro, this isn’t a problem. If we all think back, the Air got its name for a reason when it was released. 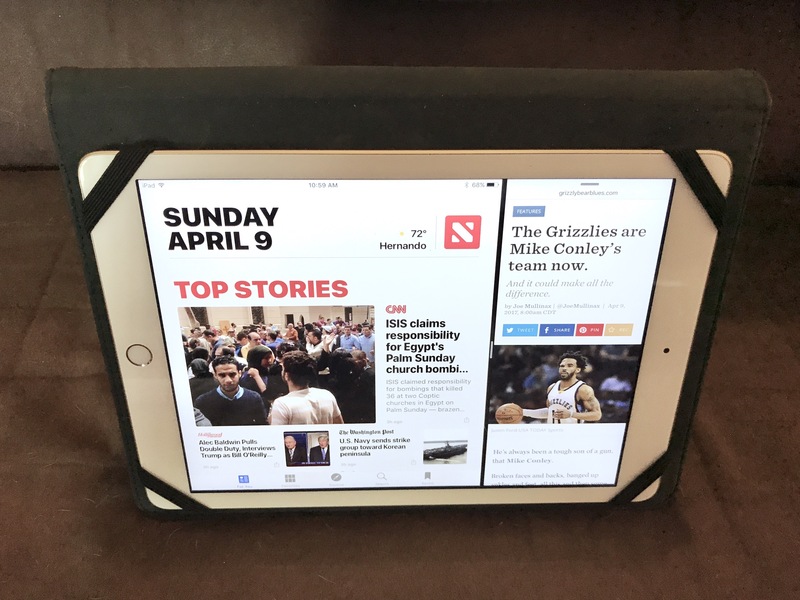 Even though the size difference between the Air and Air 2 is measured in millimeters, fitted cases made for the Air 2 will not work for the new iPad. As you can see in the picture below, a more flexible Air 2 case may work, but the fit won’t be perfect. On the flip side, all accessories made for the original Air will work perfectly with the new iPad. Buyers should be able to get good deals on items that are usually expensive, such as Smart Covers and keyboard cases. Beyond the processor, memory and screen upgrades, the new iPad offers several other upgrades for users of older iPads. These include TouchID and ApplePay, better cameras, better speakers, better Bluetooth and WiFi features, and access to the latest version of iOS for at least the next year or two. Right now, that means full multitasking, which none of the iPads before the Air 2 had. The fact that the $329 price gets buyers 32 GB of storage space instead of the 16 GB that older devices came with at the base price is another plus. Combine the extra space with the superior flash memory management of the new Apple File System in iOS 10.3, and you have another solid performance boost for a lot of people. At the end of the day, the new iPad may not be a Home Run, but that’s ok. It doesn’t need to be, at least not for us power users. While I was thinking about this, I recalled an old NBC advertisement for network show re-runs over the Summer. It went something like, “If you missed it the first time, it’s new to you.” Well, for the two segments of buyers that the new iPad is aimed at, it will feel new to them. It won’t seem like a compromise or a device of trade-offs because it won’t be. They will be getting access to the latest version of iOS and hardware features they haven’t had before. For them, it will be either a new device that is better than what they had before, or their first iPad altogether. If we judge the new iPad by this measure, then it comes out standing on second base with a clean jersey. I tip my cap to Apple for making a fine play with the design and marketing of the new iPad. What do you think about the new iPad? Does it interest you? If so, I’d love to hear what you find most appealing about it. If not, what do you think of it as a device for new users or upgraders? Do you know anyone for whom the new iPad would be a solid upgrade? Let me know in the Comments below, on Flipboard or Facebook, or on Twitter @iPadInsightBlog or @jhrogersii.